Vitality is the first principle of the work of Henri de Toulouse-Lautrec, so it seems natural that if he were in a teasing mood he would go after the pallid “Sacred Grove” (1884), an ideal landscape by Pierre Puvis de Chavannes, the noted symbolist. (If a landscape can be considered ideal with so many majorly underdressed women, and no male over the age of ten—but perhaps I digress). T-L’s device is to introduce a column of real-life Parisians into Puvis’ bucolic idyll. Interesting how he does it: Puvis’s original is pale but has those dark trees and light water and figures for an overall contrast. T-L simplifies and flattens P’s tonal range, and then gives his Parisians (including himself, the short guy) all the serious darks. Well, that seemed like fun, and if Henri could do it, so could I. 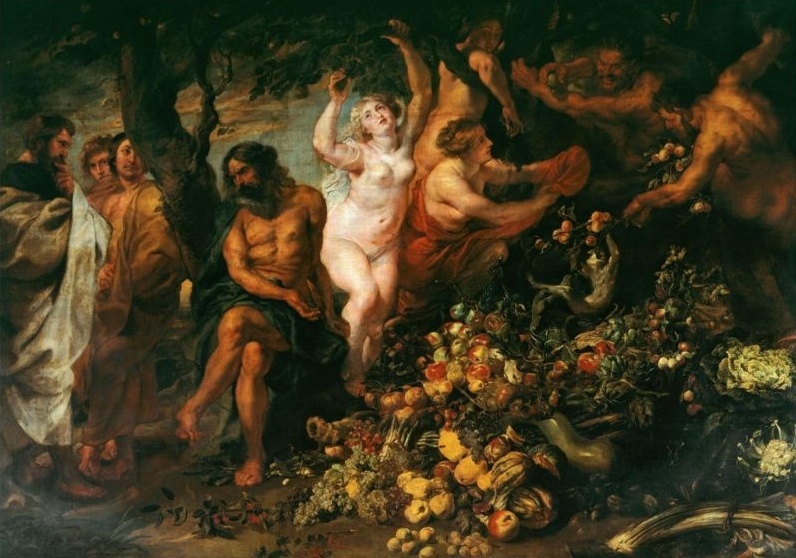 The piece that incited me was “Pythagoras Advocating Vegetarianism” (1620) by Peter Paul Rubens. Rubens knocked off many preposterous paintings, but this one, surely, stands by itself. 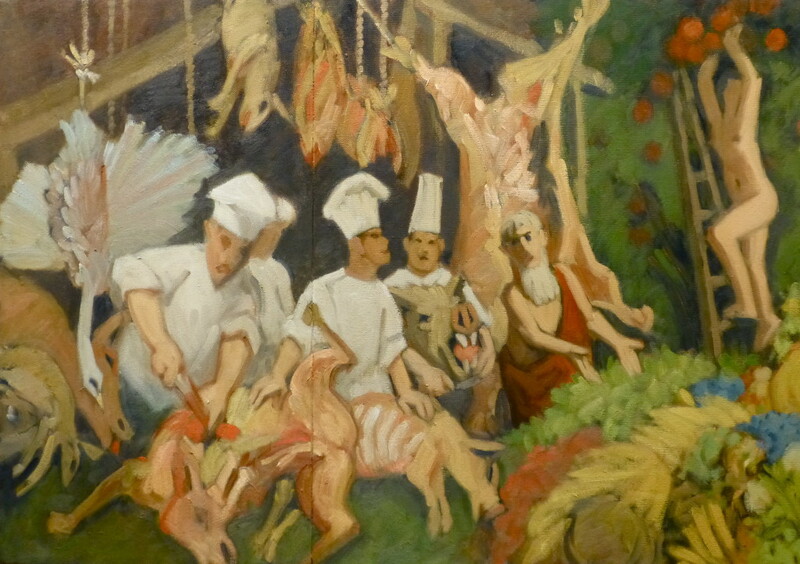 It’s not just the typically Rubensian propensity for nymphs and satyrs bounding around, but the oddly passive and inexpressive pose of the improbably meaty Pythagoras. It’s as if the model complained that he was too tired to tackle another standing pose that afternoon, and Rubens said Hey, never mind. In any case, it seemed like a Sacred Grove opportunity to modify Peter Paul’s vision. So far as I know, Rubens and I are the only two artists ever to tackle this theme.